A wonderful evening on Saturday April 13th at the Lambton Golf & Country Club to support and celebrate Frontlines, a centre for at-risk youth in Weston. Frontlines has been here for 25 years and does amazing work with kids and their families. From afterschool support to teaching kids how to cook healthy meals to managing their personal struggles, Frontlines has made the biggest difference to our community! I am happy and proud to be one of their supporters! 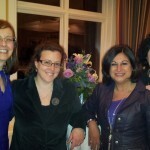 Here is a pic of me with Joyce Nyhof-Young, Paula MacDonald and a new friend, Maria Santos.